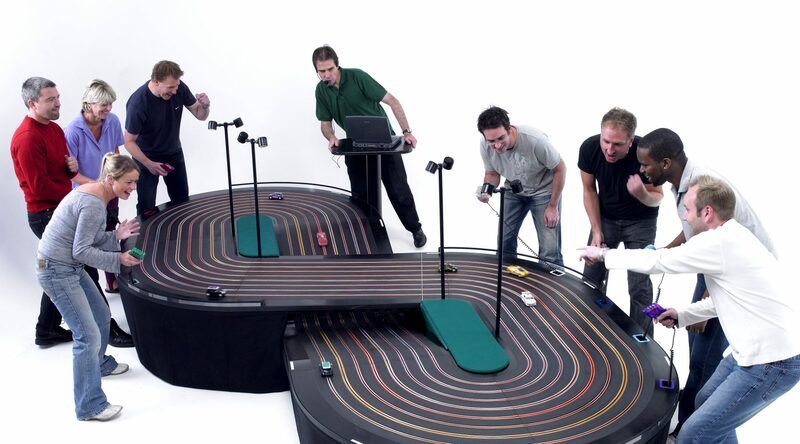 You have just stumbled across the UK specialists in Slot racing entertainment! A truly classic racing game that will put your guests in the driver’s seat and bring back all their childhood memories. 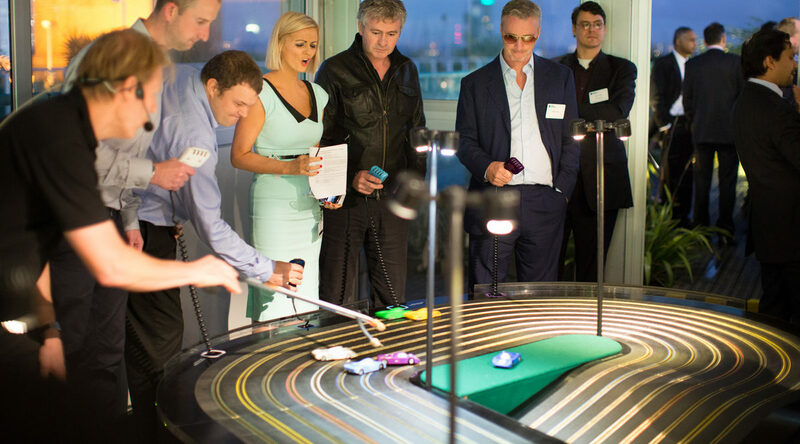 With its computerised scoring, live commentary and large-scale branding opportunities Miniracing.com Slot Racing is a great option for any event, from weddings and after dinner entertainment to business functions and exhibitions. We are the designers and creators of these awesome, purpose-built racing tracks (Yes seriously, we make these!). From the reliable and slick hardware to the sophisticated computerised scoring system; thousands of hours of research and development has gone into creating Miniracing.com equipment. Having fantastic kit is one thing, but it’s our experienced and witty compares that make our Slot racing entertainment so fun and memorable. As a family run business, with over 20 years’ experience, our passion and expertise shines through at each and every event we host. 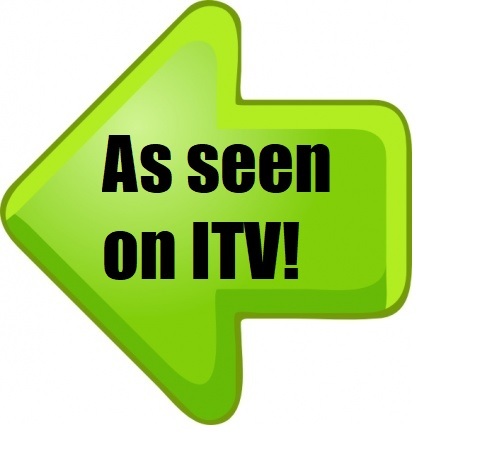 > Quick and easy to assemble in virtually any venue, across the UK or abroad. >All of our slot racing tracks come with a skilled member of our events team to provide race commentary and organise the competition. >Large scale branding opportunities; customisation of the track and cars provides a fun and unique visual marketing option. >Digital display or “Top Gear” style leader board can be provided to heighten the competitive fun. 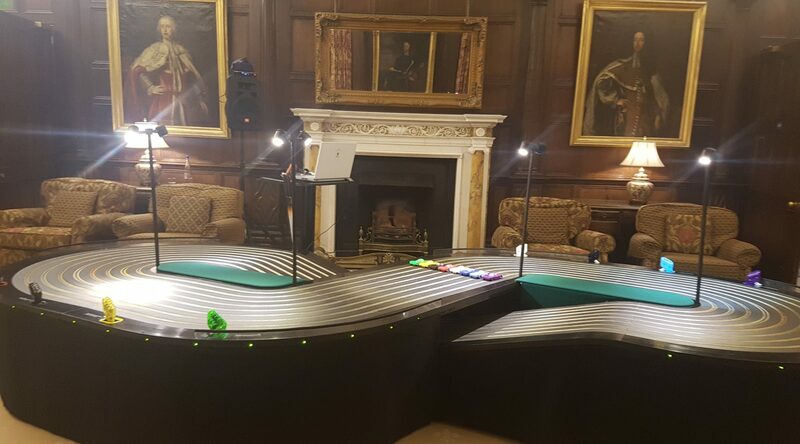 >You can have multiple Giant Scalextric tracks at an event, we can provide up to 10! 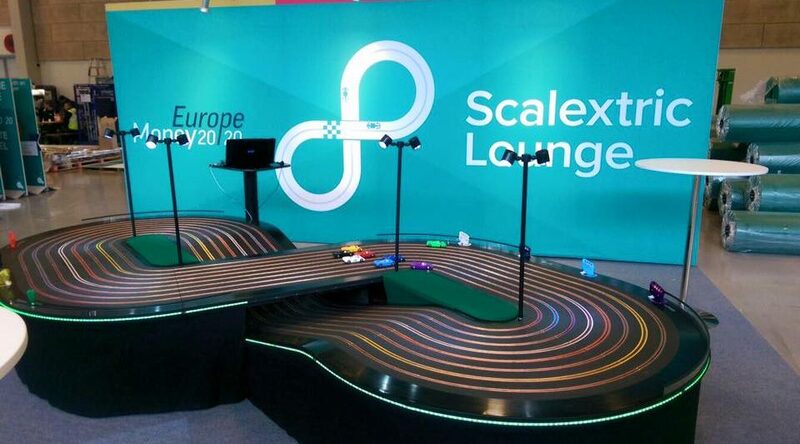 “Scalextric was a definite success…It was fun and inclusive. Setting-up and taking down the track was also quick and painless. * Company team building. The venue can be a hotel or company office. The occasion a sales conference, meeting or training session. 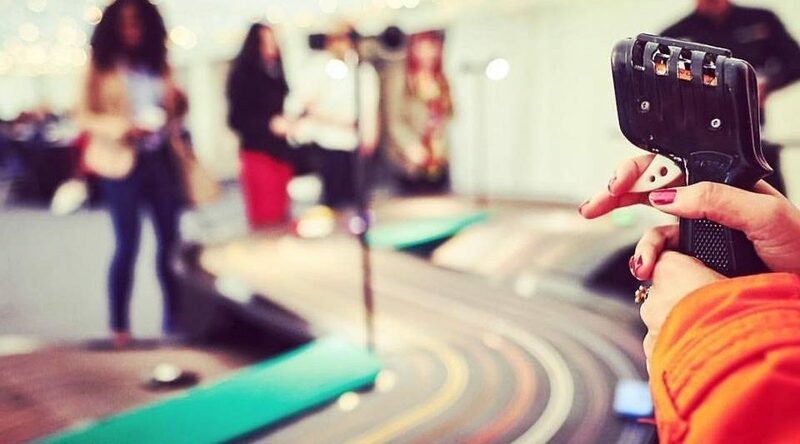 Slot-racing is the perfect way to team build and lift spirits after the serious stuff. * Award dinners and parties provide another excellent opportunity for fast-paced fun. * Annual company fun days! A daytime function with entertainment running inside and outside. A Giant Scalextric track would fit in perfectly! * The Christmas party. 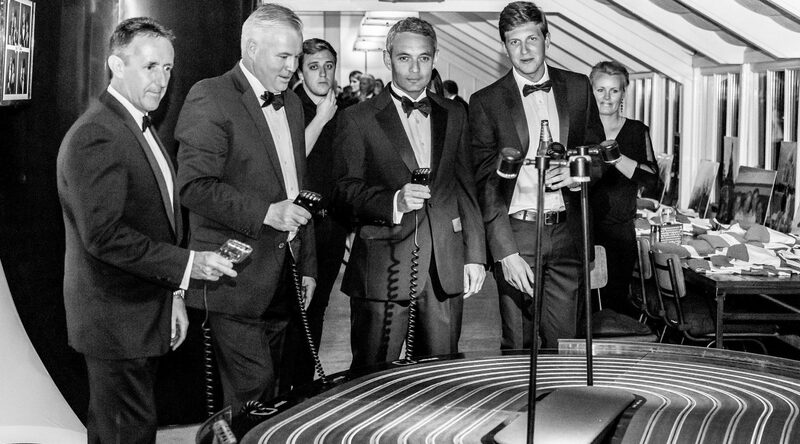 Dinner, disco, casino and Giant Scalextric are almost standard now. * Promotional Work. Our tracks can make an exhibition stand more interesting and lively (Yes, a company selling cardboard once hired a track with great results!) Other examples include car showrooms and commercial letting companies. * Wedding parties, Bar Mitzvahs and other private parties. Adds a little extra to the food and disco format! * Charity balls and fundraising events. * Club social function (cricket, rugby, golf etc). 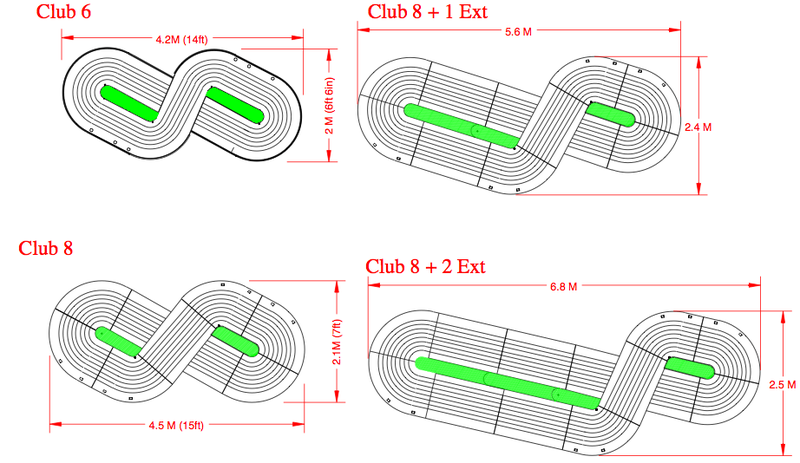 We have 6 or 8 lane tracks, which suit relatively small to quite large group sizes. To date our smallest group size is 6. We recommend larger groups (15 – 45 people). Players in larger groups usually take it in turns, enjoying a break from the intensive play. More players gives greater atmosphere, time to relax and chat, drink, eat etc. On a practical note more players reduces the price per head. With larger groups additional entertainment is recommended, maybe more tracks or just other things, Fun casino, simulator machines, table football, disco, band etc. 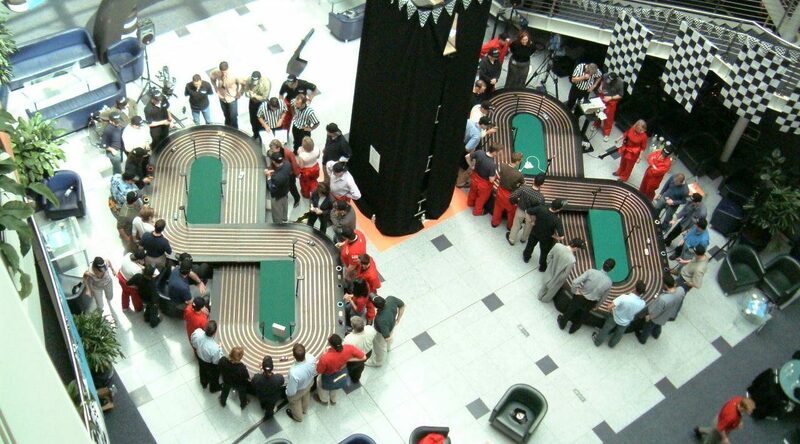 If Giant Scalextric is the only entertainment, a large group will play enthusiastically for 1 – 2 hours. A game plan giving individuals 8 qualifying heats, followed by the top 8 drivers going through to a final set of 8 heats works well. This is one of the many game styles our bespoke computerised scoring greatly simplifies. The Race Director will choose the best option on the day. Contractually we normally quote for up to 3 hours of game play. We are always happy to quote for extended running time. Yes. We can organise the taking of money at an event if fundraising is required. Predicting if and the amount of profit is difficult because it depends on many factors, which are often unknown prior to the event. Low numbers willing to take part is the principle problem. If guests have paid a high-ticket price, done the raffle, the charity auction and paid inflated drink prices etc the mood to get their wallet out may have passed. In which case the slot track will remain unused and return a loss. In these cases it is better to include the slot-racing costs in the ticket price. Take the long term view that if guests enjoy an event overall they are much more likely to come back next year. As general rule groups of 300 people or more, given the time and opportunity to take part are likely to return a profit. The Race Director uses experience and a structured competition to get the most from the event. The exact running details will depend on many things; size of group, age of group, other entertainment running at the same time in the same area etc. A simple game format is best if your event contains other forms of entertainment or you can go for a more challenging match if the concentration of players can be expected. Other factors like tiredness, alcohol consumption are all considered by our staff before a game format is run. The success of the event is about 50% due to staff organisation and 50% the equipment. 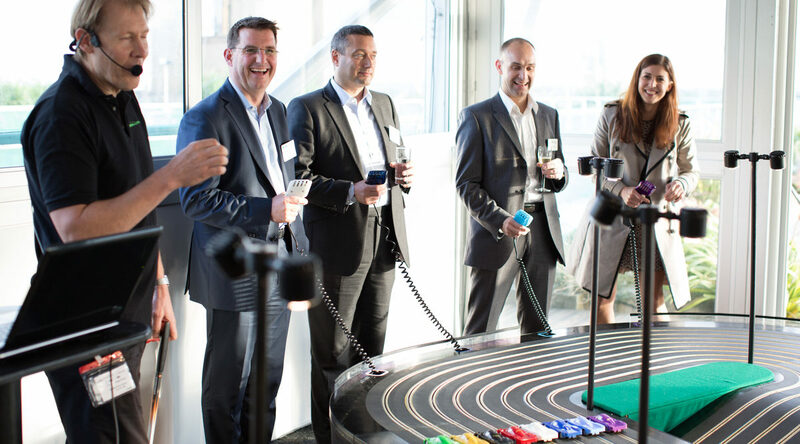 Our staff spend a lot of time running Giant Scalextric functions and this experience shows! If you want something else like a fun casino we can recommend other operators. We bring all equipment and setup in a suitable venue. Setting up time is usually about 30 minutes, although an extra 1 hour is generally advisable for contingency. Packing away takes about 20 minutes. Great track, cars and computerised scoring is just the start. There is a very important job to make the event run well. This is the job of the “Race Director” who will referee the game using the public address system and radio microphone to address the crowd with race commentary. They will also organise the structure of the game using the computerised scoring, making sure the rules are clear and implemented! miniracing.com manufacture the equipment as well as run events. Much is purpose built. Spotlights give the copper rails and black track surface a dramatic look. The precision form of the whole shape gives a creative, sculptural look. Reliability is our top priority. Off the shelf slot-car racing track made to a keen price can give trouble. Unfortunately professional entertainers work in difficult situations without a skilled technician in attendance. Coming back tomorrow with a spare scalextric part is never an option. Our high quality equipment together with back-up systems for all critical components gives peace of mind to event organisers, staff and carefree fun to the players. 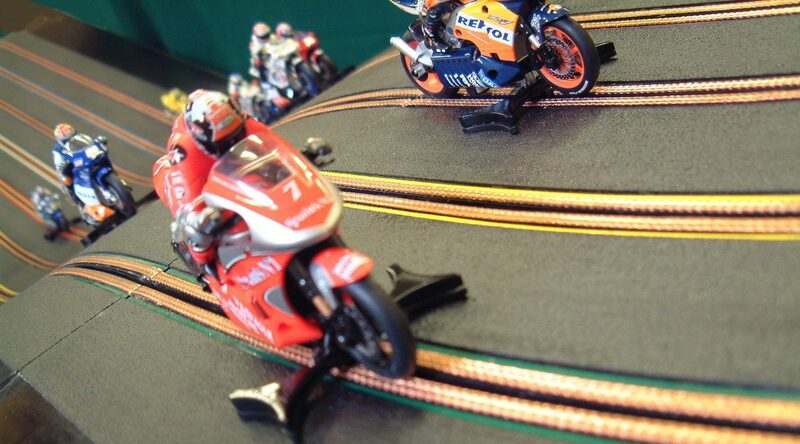 The surface of the track is free of bumps and ridges which makes play much more controllable. The players dictate the results not track irregularities. We use top brands of cars and controllers for consistent play. Price is inclusive of staff to set-up and run the event, computerised scoring, PA equipment for race commentary and all other necessary equipment.